Allowing yourself enough time to play. Not just a quick 30 minutes here and there which encourages "gambling" rather than the patient play that is required. If I'm feeling tired then I won't play. Instead I'll often sleep for a while until I'm ready to play. 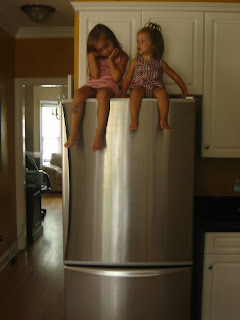 Sometimes I have to leave my daughters on the fridge to avoid being distracted! All what you said is right... and that is my big problem. I'm not a professional player yet. I have a regular job where I work 40 hours a week. I work sometimes on day shift, night shift, weekend, etc... My working schedule is very difficult to handle because It is not a monday to friday 9 to 5 job. On top of that, I try to play 50 000 hands of poker / month. The result is that I almost always play tired and I'm not always focused. I go on monkey tilt sometimes and I play when I should not because I need sleep. You are lucky to be able to focus on your game. I'm thinking about leaving my regular job to concentrate on poker, but I don't have the balls to do it yet... maybe at the end of the year, I will see. Anyway, it is not an easy decision. JP. We play together a lot on FT, so I know your game pretty well. Like you say though, you need to avoid playing at the times when you're tired/tilting because in that frame of mind it's easy to lose money at a faster rate then you can win it at when you have your "A" game.